I picked up this Wooly Snuffle Mat from Paw5 at SuperZoo because I had never seen anything like it before. Is it a doormat? A sound muffler? It's actually a puzzle toy. A very different kind of puzzle toy. I want to call it a low-impact foraging toy. It's made from fabric remnants that would otherwise be going in the trash, the fabric is sort of a stretchy bathing suit material. 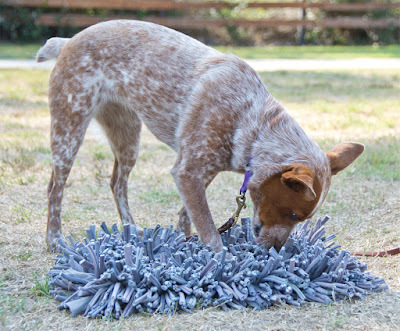 The idea is to hide kibble or treats on the mat, you can pour it on and just wiggle the thing around a bit so it sinks. Then the dog has to sniff around and find the food in all the fabric curls. I admit, I was a bit skeptical when I bought it. 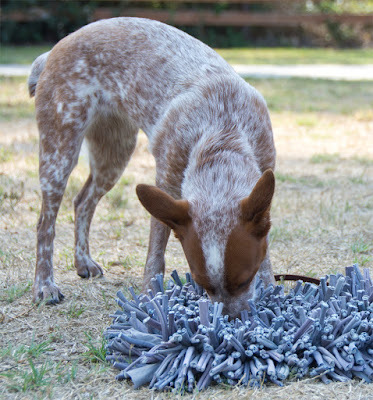 There was a substantial discount at SuperZoo, but I did pay for the privilege of owning a Wooly Snuffle Mat. I like Paw5, they report that these mats are made in rural Thailand by a progressive woman-owned company. That's an industry I can get behind. I also like how accessible this toy is. The dog only needs to be able to sniff to use it. Blind dog? No problem. Limited mobility? 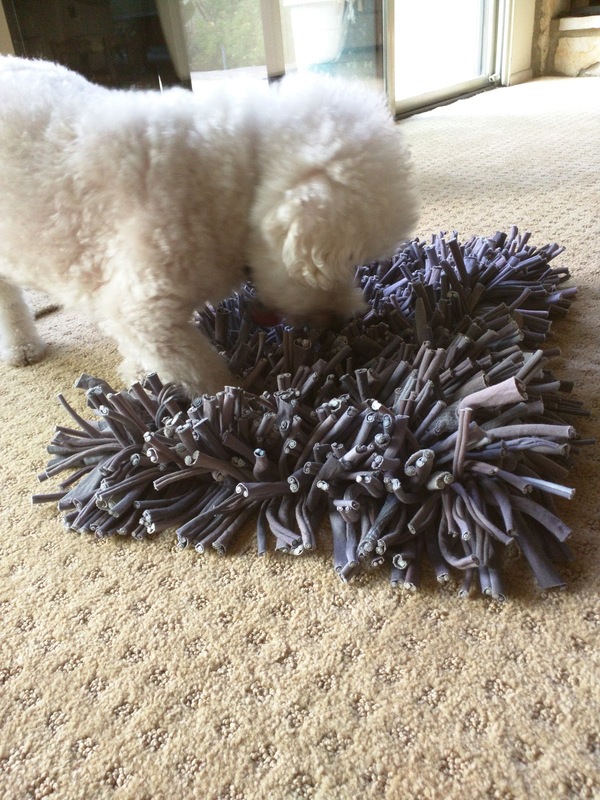 Wooly Snuffle Mat isn't going to roll away. Super skittish dog? It's silent and non-threatening. Ozzie the Bichon hunts for treats. I can put more than a cup of food on this thing at a time. Putting 3 or 4 cups of kibble on it would work, the motion of the dog eating would push a lot of the food further into the mat. Dump food on mat, maybe shake mat a little. The only downside is that I can't load it up on the counter and then move it without dropping kibble everywhere. The first dog to try out my Wooly was a client dog, Ozzie the Bichon. Ozzie is ten years old, and very food motivated. I hid four or five treats at a time, and Ozzie spent almost ten minutes intently searching for them, and then checking to make sure there weren't any more. I don't think I've found anything else that resulted in that much sustained activity for that few treats. I fed Annie several meals on the Wooly, and she went from being the fastest eater to the slowest! Tiny baby chihuahua? Great Dane? Bunny? Pony? Everyone can use this mat. It's too big to be a choking hazard, and doesn't have to be moved in order to work. I suspect that some dogs might learn to pick it up and shake it, though. It's really well put together. I guess a dog could shred it if they really wanted to, but nothing approaching "normal use" is going to damage this thing. It's a mat, nobody is taking it anywhere. Cats. Rabbits. Guinea pigs. Rats. Bearded dragons. Geckos. Goats. Horses. Toddlers. Parrots. Xhuuya might just pick it up and shake it, but I could probably secure it to a surface for her. This is the most highly-rated puzzle toy I've reviewed on The Dog Geek.